Fibromyalgia (FM) is a common and complex pain condition characterized by widespread pain and tenderness to the touch and is often associated with fatigue, sleep problems, depression, anxiety, and memory problems (“brain fog”). Approximately 10 million Americans (2-4%) have fibromyalgia with a ratio of about 8:2, women over men. The cause of fibromyalgia is unknown, although genetic, psychological, infection, and trauma causes have been suggested. Researchers believe that the pain is caused by changes in the brain that cause the person to be more sensitive to pain. A diagnosis of fibromyalgia is based on the following criteria: widespread pain, the persistence of the severe symptoms for at least 3 months, and the absence of any other identifiable disorder or disease that would explain the pain. As fibromyalgia symptoms overlap with other conditions, a full laboratory work-up is helpful to rule out other conditions. An integrative medical-therapeutic approach results in the best management of symptoms and improvement of the quality of life. Treatments include lifestyle modification, dietary changes, dietary supplements, medications (for sleep interference, fatigue, depression, and pain), Physical Therapy, Medical Acupuncture, psychological & mind-body strategies to address chronic depression, stress, and anxiety, and education. Aerobic exercise, aquatic therapy, yoga, tai chi, and strength training have been found to reduce symptoms. In refractory cases, treatment with Medical Cannabis may be helpful to alleviate pain, provide muscle relaxation, and improve sleep. Myofascial Pain Syndrome (MPS) is a chronic condition that affects approximately 9 million people in the U.S., including 95% of people who have chronic pain. MPS can affect either a group of muscles or a single muscle and develop as a result of injury or overload. Many different activities put people at greater risk for MPS—such as intense exercise, abnormal posture, joint dysfunction and even conditions like sleep deprivation and chronic infection. People whose jobs require them to do repetitive physical work or have a poorly designed workstation are also at greater risk, as well as people with certain physical abnormalities. MPS usually involves “trigger” points (see illustration) which are areas where a person experiences the pain, but not necessarily where the actual pain is being generated. Although pain is the primary symptom, people often experience other symptoms, like fatigue and sometimes depression. Trigger points are categorized into active and latent. 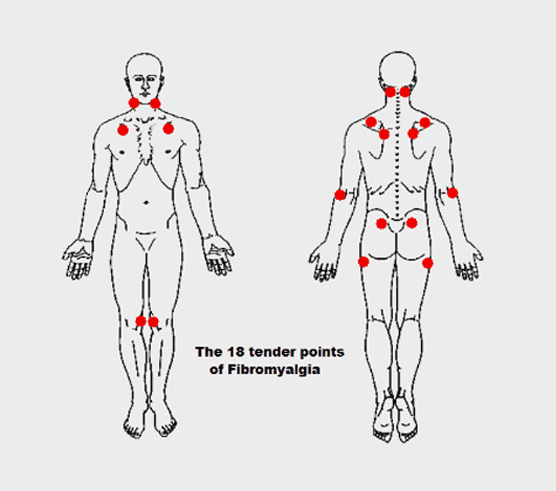 Active trigger points are extremely tender and found within the muscle that is generating the pain. A latent trigger point is less tender and inactive. Physical Exam: Dr. Prywes will perform a comprehensive musculoskeletal exam, evaluating postural and muscle imbalances where tender trigger points often arise. Gentle pressure is applied to affected areas to assess for tight muscle bands and to better understand the trigger points and responses. Rehab Management: Stretching exercises and applying moist heat in conjunction with Physical Therapy is used to reduce pain and improve the flexibility of tight muscles. Topical and oral pain relievers may also help. Dr. Prywes may recommend Trigger Point Injections or a course of Medical Acupuncture to facilitate progress.